Approximately one year ago, PWTIC proceeded with the first experiment in mankind’s quest to combine bacon with coffee. Results were satisfactory, but it was apparent that refinement of the method could lead to further advances. Two follow-up experiments in combining bacon with coffee were conducted under careful laboratory conditions. Test #2 is presented below. Test #3 will follow in next week’s volume. 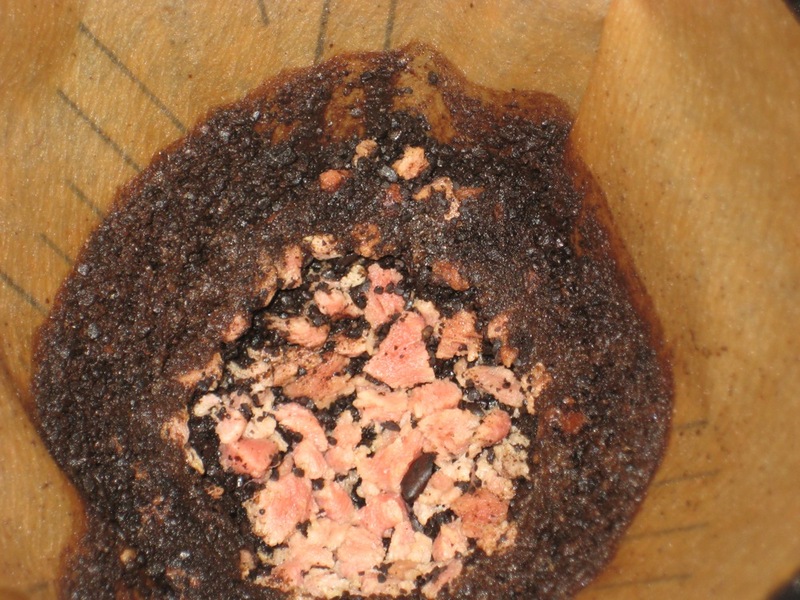 No-Name brand SIMULATED BACON BITS CONTAINS NO MEAT were distributed over the coffee grounds. Coffee was then brewed as normal. 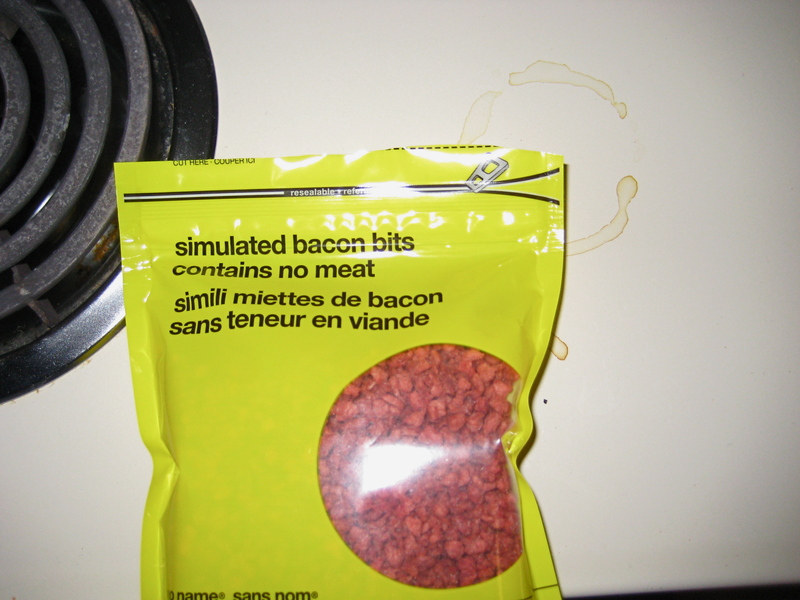 The primary finding was that SIMULATED BACON BITS CONTAINS NO MEAT did not contribute the desired amount of flavour. Even after sweetening with cream and honey, the coffee remained nearly unaffected, save for an unpleasant increase in saltiness. Researcher concluded that bacon bits in coffee were not even repugnant enough to be of significant interest. 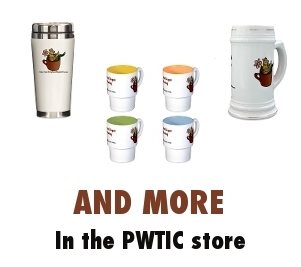 http://www.torani.com/products/bacon-syrup – you’re making bacon coffee go mainstream! I guess that’d be the easiest way to get bacon flavour in coffee. But until I see it in stores here, I gotta keep experimenting. This is tremendously disappointing news. But reminds me that I just bought some PC Bacon & Sundried Tomato salad dressing, which was very promising on paper but not very pleasant to eat (at least not on salad). You can borrow it if you want. It has noticeable hickory effects. Maybe you should fry some actual bacon up, dice it and chuck it in for that authentic taste? Or possibly steam the bacon and use the steam water with the coffee – lots of flavor there..? 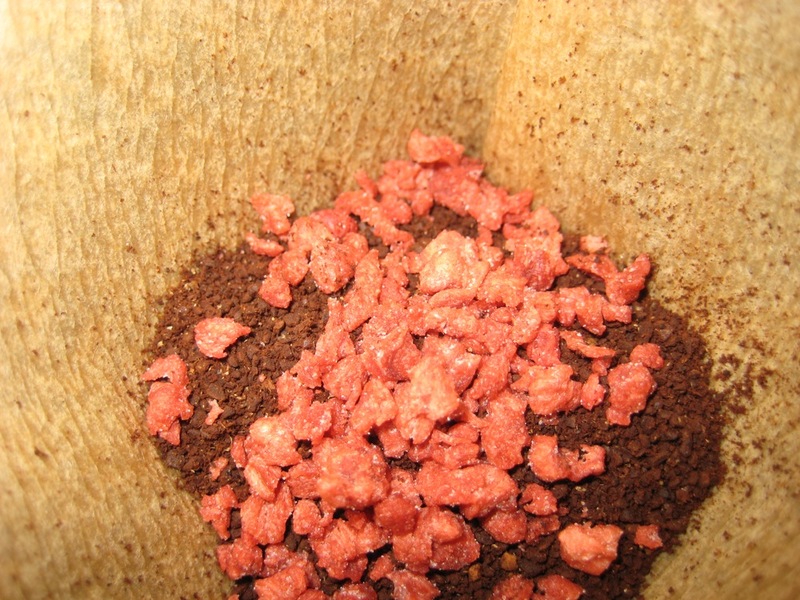 Bacon/Coffee experiment with so so results | Bacon Salt Cluster Blog about Gourmet Seasoning, Spice, Salt and BACON!